Its 2089 and, on an archaeological expedition, Elizabeth Shaw (Noomi Rapace) and Charlie Holloway (Logan Marshall-Green) discover a cave full of ancient paintings. One design is of particular significance as it, along with similar drawings found on artifacts throughout the ages, depicts a specific planetary location. Charlie and Elizabeth believe that this planet holds the answers to life’s central mysteries - who are we and where did we come from? Jump forward to 2093, and they are journeying to Planet LV 223 on the spaceship Prometheus, each desperate for answers, each unaware of the dangers that lie ahead. Opinions on Prometheus have been hard to ignore. For a start, the film was hyped to a massive degree. The release of a teaser trailer was an international event such was the global anticipation for this film. As much as I tried to avoid forming an opinion about Prometheus (before I had actually watched it), I was well aware that audiences generally found the film disappointing. As a result, I decided to let the dust settle before I watched the movie. Perhaps too much dust really as now talk of Prometheus 2 is building. So definitely time to watch the movie then. Wow, what a great cast. This is all so beautiful and gorgeously cinematic. Am now thinking about Werner Herzog’s fabulous Cave Of Forgotten Dreams. How amazing was that documentary? Michael Fassbender is awesome in everything. Name me an accent he can’t do - seriously. Blimey. Is that Guy Pearce? 2mins without your suit and you are dead. Good to know. How cool is that mapping technology? The sets on this film are amazing. Imaginative and stunning. So much work must have gone into every single scene. Finally something has happened. Shame it all feels a bit ridiculous though. So David is officially creepy now. That is officially gross. But also stupid and not even scary. That is not who you think it is - dopes. Seriously? So much is happening right now that doesn’t make any sense to me. This film looks amazing but I feel no tension, couldn’t care less about the characters and wish I had just watched Ripley again instead. Feel I am in the disappointed camp on this one. I love a good SciFi story and Prometheus certainly looked the part but I just didn’t enjoy this film. Noomi Rapace gives a really good performance (especially given the material she had to work with) and Michael Fassbender is superb but they couldn’t save this film. I am not sure if the above review worked. At any rate, if I went for this format again, I will def be more accurate with my time points. Apparently, if you watch the behind the scenes extras on the Prometheus DVD it all becomes clear and makes you feel as if this is a better movie. Not sure I can be bothered actually - given this movie enough of my time already. 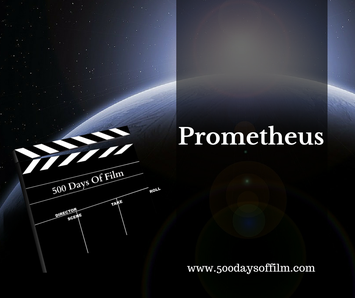 Have you watched Prometheus? What did you think? Whether you agree with me or disagree (and you certainly have that option) let me know in the comments section below!